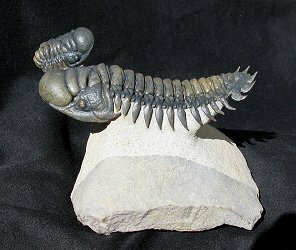 Size: Larger trilobite is 3.8 inches long! This is a spectacular trilobite fossil. It is a stunning NATURAL double specimen of Cheirurus (Crotalocephalina) gibbus from the Devonian of Morocco. This awesome piece was microscopically prepared in the EXTINCTIONS Prep Lab here in Colorado. There are two trilobites preserved together - one huge adult and a cool juvenile. The larger trilobite is EXTREMELY 3-dimensional and wonderfully articulated. The detail of the trilobite is just amazing - the very small eyes are easily seen, the triangular pleurons terminate in sharp points, and the upswept pygidial spines are intact and have been prepared in a free-standing position. The bug has outstanding color and contrast and is beautifully showcased on the pillar of sculpted limestone - the hypostoma (mouthplate) has even been exposed in preparation! The baby is also very detailed and well displayed. This specimen is more impressive in person than what the pictures show. This is a top quality double specimen of Cheirurus (Crotalocephalina) gibbus - one of the most displayable examples of this type we've prepared.